A PRIMARY school in Lancashire has won the adoration of teachers and parents across the country after sending its leaving year six pupils a letter telling them that "there are many ways of being smart". 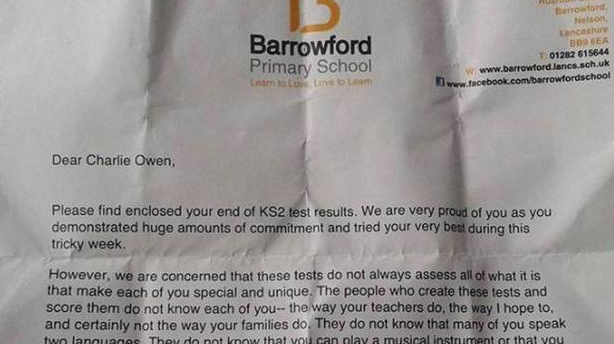 The message, included with Key Stage Two results for children at Barrowford Primary School, told them to remember that "the scores you get will tell you something, but they will not tell you everything". The letter was sent out yesterday signed jointly by the head teacher, Rachel Tomlinson, and the head of year six, Amy Birkett, and addressed directly to pupils themselves. It started being shared on Twitter this morning, and users said it should be "the first thing the new Education Secretary Nicky Morgan should read". It champions the role of teachers over standardised testing and centralised controls over education - issues over which the now-former education chief Michael Gove was repeatedly criticised - saying: "the people who create these tests and score them do not know each of you". The letter is not actually very original - and did the rounds on Facebook last year in the US when it emerged from an unidentified elementary school "with the names of the principal, pupil and state removed". The text includes a couple of Americanisms - including a mention of travel to "a really neat place" - but it is nonetheless thought to be the first time it has been picked up and used by a school in the UK, and as a result has gone down a storm on Twitter over here. Ms Tomlinson admitted that she had found the text online around six months ago and, having emailed it but lost the link to the original, felt it contained sentiments worth passing on to the children at the end of the school year. She said that since the letter had been shared online by a parent, the school had been "both surprised and pleased" by an extraordinary international response. "It's been really positive and lovely," Ms Tomlinson told The Independent. "We've felt supported as a school globally - and it's a surprise too because the message is really no different to what we do on a day to day basis." The head teacher said the letter had certainly not been a political statement regarding today's reshuffle or Mr Gove's policies - "because what would be the point of making a political statement to 58 primary school children?" "What the letter isn't and hasn't been at all is a caveat for poor results," she said. "It is just a case of saying to the children well done, we are really proud, but remember the context of the exams and that it's only a little bit of what they take away from the school". On Twitter, Ian Duhig said it showed "what teachers can do and tests can't", while another user said it was "a fantastic example of what primary school should be about". Jo Braddock wrote: "Barrowford Primary School really need to be commended for this approach," and Sharron Galley said: "This has made my day. Well done Barrowford Primary - you sound ace." Here is the text of the touching letter in full: "Please find enclosed your end of KS2 test results. We are very proud of you as you demonstrated huge amounts of commitment and tried your very best during this tricky week. "However, we are concerned that these tests do not always assess all of what it is that make each of you special and unique. The people who create these tests and score them do not know each of you- the way your teachers do, the way I hope to, and certainly not the way your families do. "They do not know that many of you speak two languages. They do not know that you can play a musical instrument or that you can dance or paint a picture. They do not know that your friends count on you to be there for them or that your laughter can brighten the dreariest day. "They do not know that you write poetry or songs, play or participate in sports, wonder about the future, or that sometimes you take care of your little brother or sister after school. They do not know that you have travelled to a really neat place or that you know how to tell a great story or that you really love spending time with special family members and friends. "They do not know that you can be trustworthy, kind or thoughtful, and that you try, every day, to be your very best… the scores you get will tell you something, but they will not tell you everything. "So enjoy your results and be very proud of these but remember there are many ways of being smart."